Find your team: See the history of each of the 47 teams in the Premier League here. 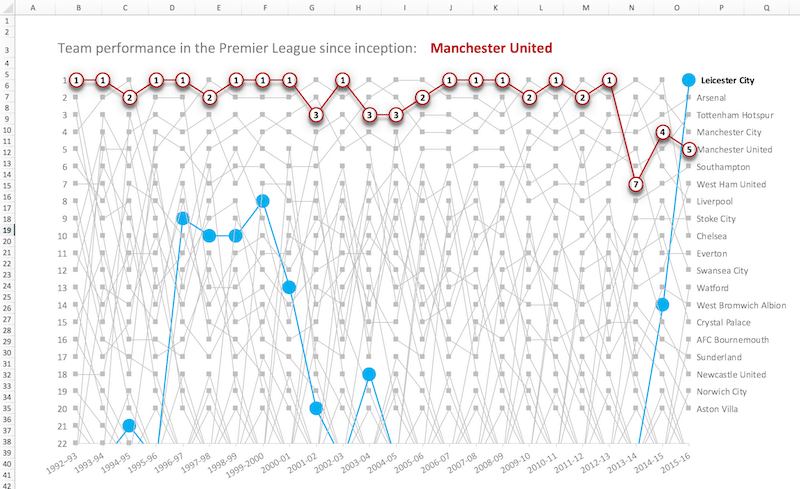 In this post I’ll show you how to create a dynamic bump chart like the one above, using historical data for the English Premier League going back to 1992-93 when it was created. Feels like a very long time ago, a bygone era, when Nottingham Forest were hanging out with the big clubs near the top of the Premier League. And here’s my own team, Liverpool, one of the world’s elite clubs struggling to regain the success of their glory days, yet to win a Premier League title. We came so close in 2013-14, but for one unfortunate slip at a crucial time, when we lost 0-2 to Chelsea at home. 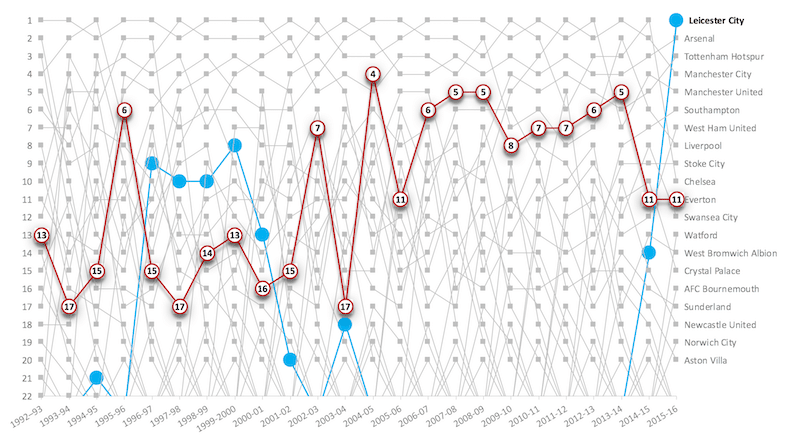 Click here to see the history of all 47 teams who have made an appearance in the Premier League. Creating a dynamic bump chart in Excel? 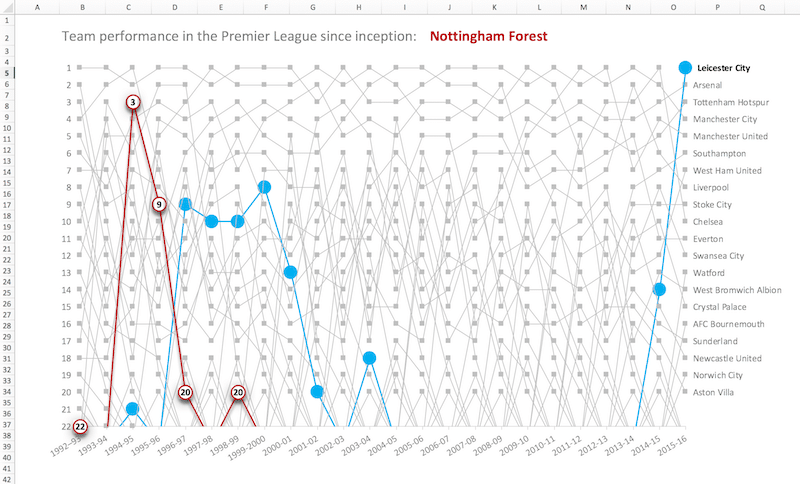 I found all the data I needed for this chart on the Premier League pages of Wikipedia. I stacked all of the tables for each season into one giant table of 486 rows, which has all 24 seasons data. I added a column to identify each season, expressed as a text value e.g. “1992-93”. You can copy all the data from here if you want. Next I had to do a little data cleaning to standardize all of the names, for example changing Arsenal !Arsenal *(C)* to Arsenal. First I made a copy of the team name column (which I colored to distinguish it), so I could keep a record of the original data for checking. Find *Arsenal* and replace with Arsenal. By adding the * in front of and after the string “Arsenal”, I could fix all the variations in one search. 1. 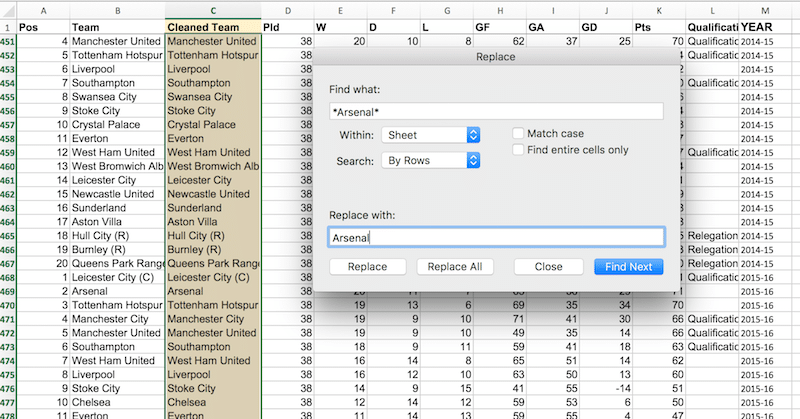 Select the entire table of Premier League data (Ctrl + A) and Insert > PivotTable. 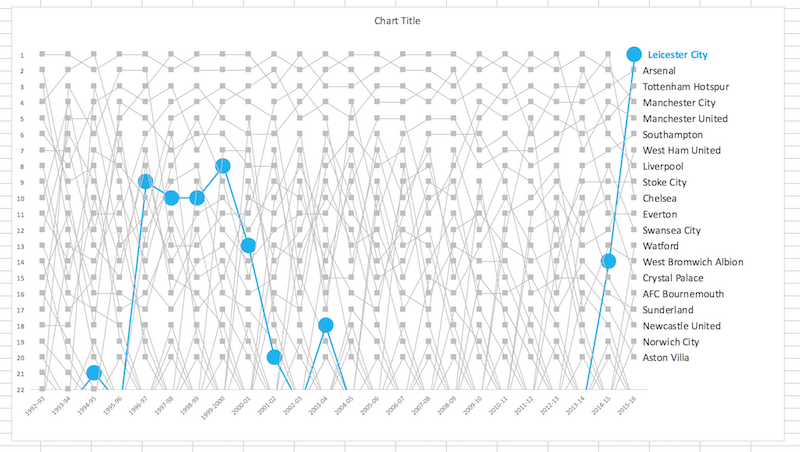 Add the Cleaned Team to Rows, YEAR to Columns and Position to Values, as shown in the following diagram. 2. Make a copy of the pivot table data in a new tab. Select the whole table (Ctrl + A) then fill in all the blank cells with the value 23, i.e. 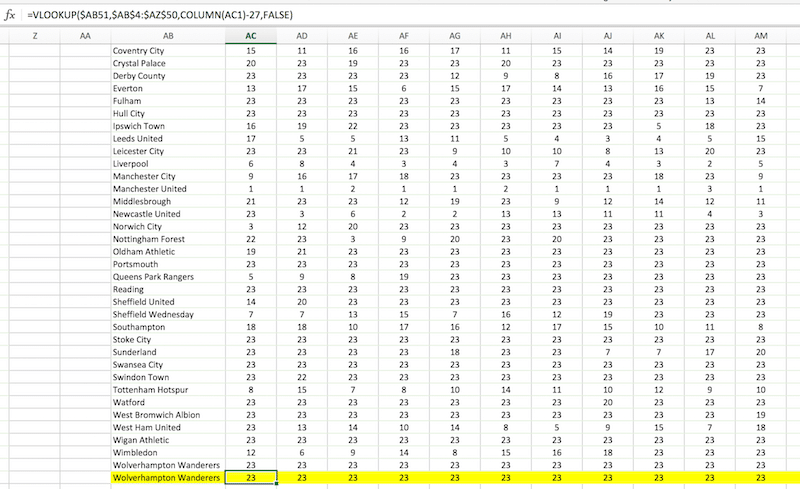 for any of the teams that are not in the Premier League that season, rank them outside the top 22 (the max number of Premier League teams during the early seasons). Use Find and Replace again, this time leave the find box empty (blank) and put 23 in the replace box. Then hit Replace All. 3. Underneath this table, we’re going to add a line for the dynamic values that change when a user chooses a different team. 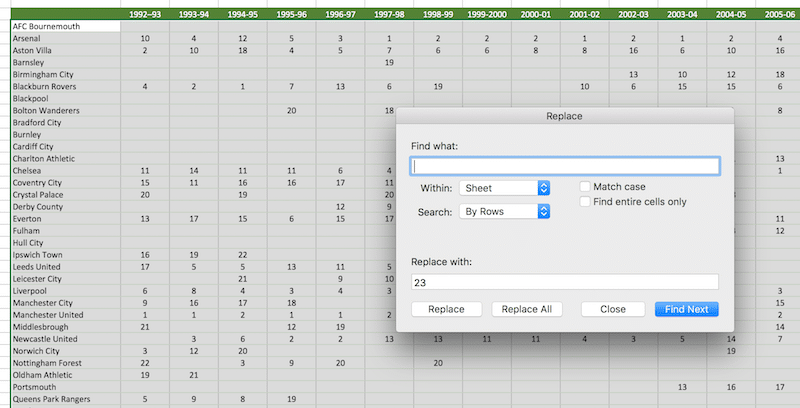 You can use a shortcut to save typing the column reference number into your VLOOKUP formulas. If you’re in a different column to AC, then adjust the number 27 in the formula to account for the number of columns before your current data table (i.e. A to AA is 27 columns before my chart data table starts in column AB). Finally, let’s draw the chart. – click on the data labels one-by-one and delete all except the last one. It’s super tedious with all these lines believe me. So let’s use a bit of VBA-fu to do this for us in under a second (for a primer on VBA read this). Now that your Excel file contains VBA, you’ll need to Save As and select the macro-enabled file .xlsm. 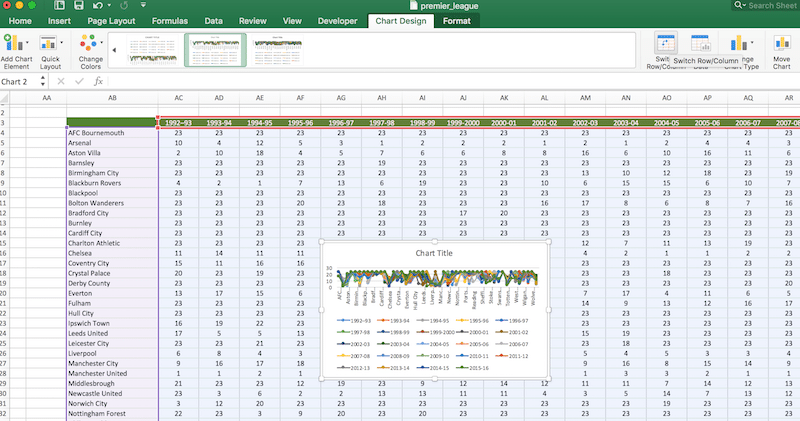 Click the chart area and move it in to give the data labels more room. 8. Noticed anything weird about that y-axis? 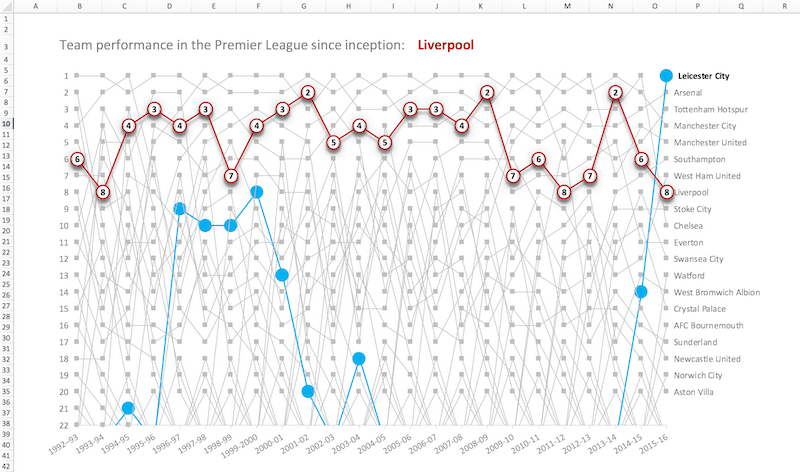 Yeah, it’s upside down for our purposes, showing the top league positions, 1st, 2nd, 3rd etc., at the bottom of the axis and the bottom of the league positions at the top of the accident. Let’s flip it. to fix the axis, so that number 1 is at the top. 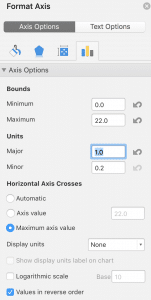 Set the bounds on the y-axis to from 0 to 22 inclusive and the Major Units to 1.0 in this same format panel. 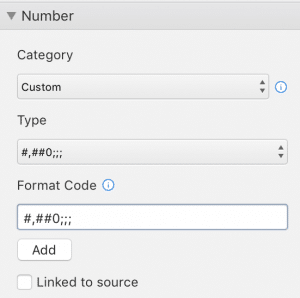 Finally, in this panel, change the number to a custom format: #,##0;; so that the 0 is not displayed (hat tip to Chandoo for this hint). 9. Time for a quick tidy up of the x-axis too. Select it, then in the format pane select the “Text Axis” checkbox and the “Between tick marks” axis position. 10. Add a new blank tab to your workbook. Cut and paste the chart into this new tab. While you’re at it, select the gridlines by clicking on one of them and delete them since they’re just cluttering up and confusing in this chart. 12. Adding the dynamic line element. Click the Source input box (no. 5 in image below). 13. 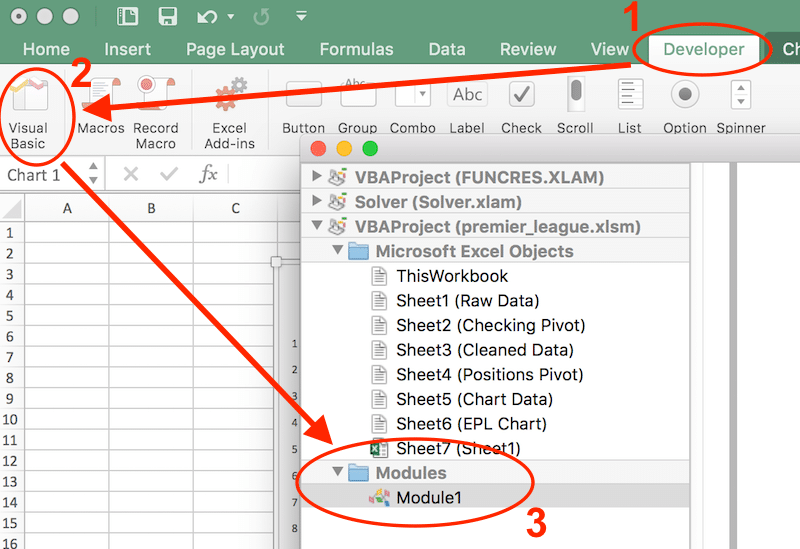 Return to the chart data table, to the cell at the bottom where we input all those VLOOKUP formulas in Step 3.
where “EPL Chart” is the name of my chart sheet with the data validation. 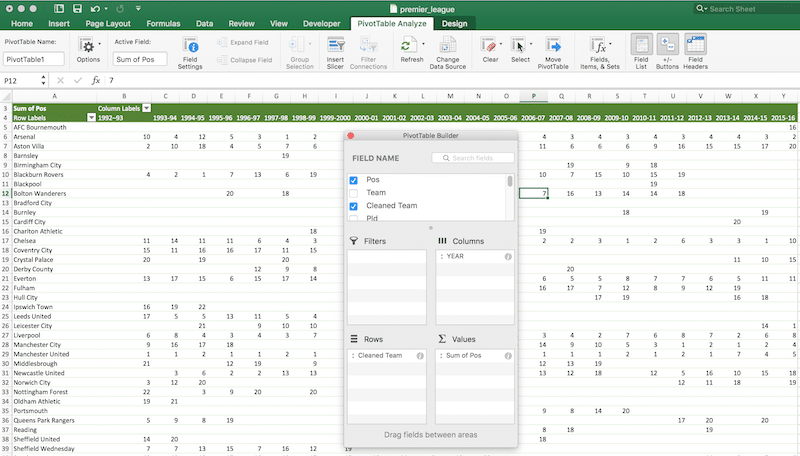 Now this cell is linked to the drop down menu, so when a different team is selected this cell will change and so the data in the VLOOKUP cells will change since they are using a different lookup value. Test it out by choosing a different team in the drop down menu. 14. Format the dynamic line representing the user selection. This line is already in the chart as a duplicate of whichever team you have selected. So it just needs to be selected and formatted to stand out. 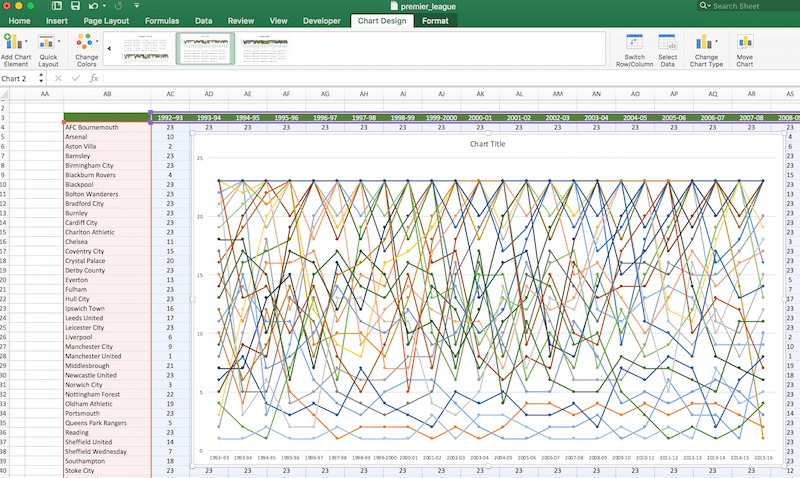 Select the line in the chart menu: Format > then the drop down menu of chart elements > select the very last team name series (not the data labels). Hit Ctrl + 1 to bring up the formatting menu and change the line format (dark red + 2pt + large markers). 15. Format the dynamic line data labels. This is a little tricky. Follow step 13, select the very last team Data Labels in the Format chart menu drop down. Hit delete to remove, since it’s just the last data label showing the name. – on the home menu, change the font size to 14pt and bold, so these values stand out. The values represent the position the team finished in that season. 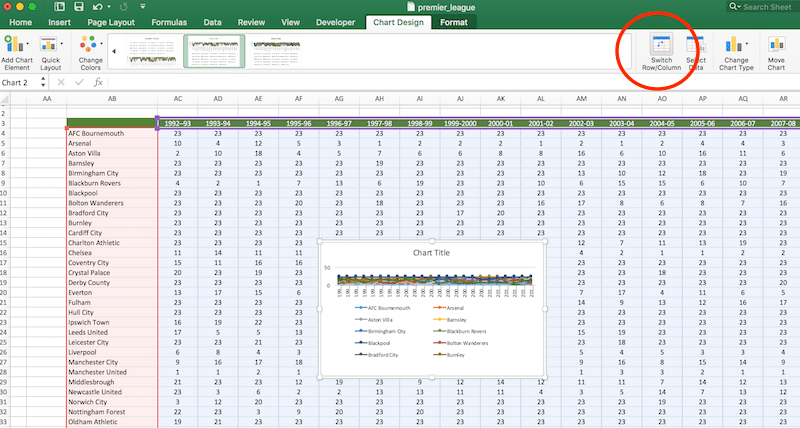 From here, you can add a title with above the chart and move the drop down menu in the cell adjacent to the title if you like. Let me know if you have any questions, comments or ideas for improvement in the comments below. Have you done step 13, which changes the team name to a dynamic cell reference? Alternatively, check you have your data in the same ranges (same cell references) as my examples otherwise the formulas as written won’t work. 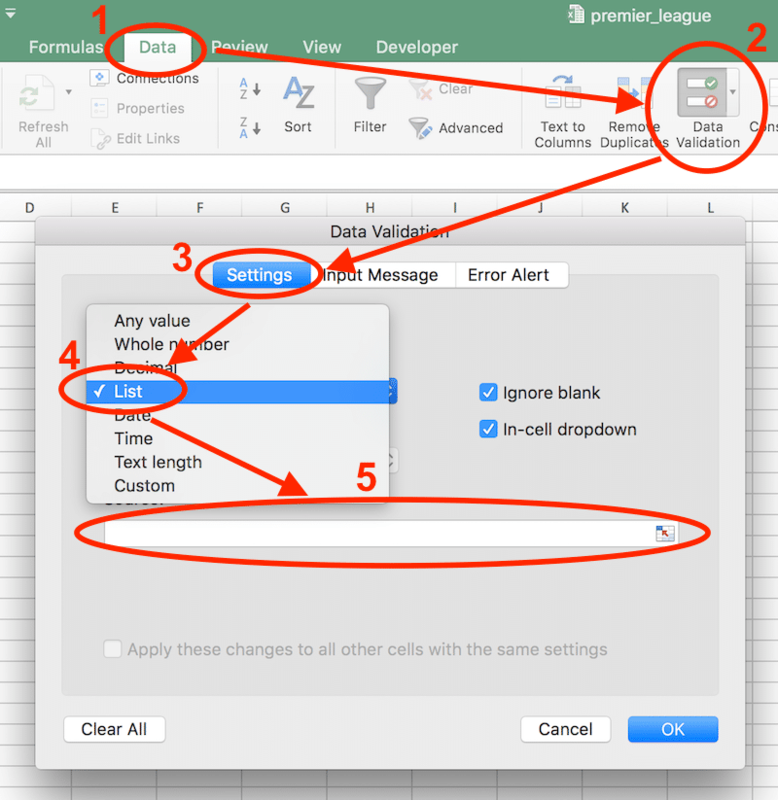 The screenshot diagram in step 3 shows the vlookup formula and cell references, so you need to have data in the same place (or change the formula references). Step 14 is to select the last line (series of data) and then format this red. When you change the formulas this line will change position, depending on team picked. Hope this helps! Let me know if you have any other questions.